This is an unfortunately long post, and I apologize for it, but the reason is that I find all this so darn interesting. Hope you do to. Once again, low carbohydrate dieting does not seem a good idea if we want to preserve muscle mass while we lose fat mass. But the questions remains unanswered; how much muscle mass do we lose if we go low carb and can we do anything to prevent a potential loss of muscle tissue? Let us look at some studies and see what they tell us. All participants in the above study were women and they were obese. Dietary energy content was reduced in both diets and body composition was measured using Dual Energy X-ray Absorptiometry (DEXA). 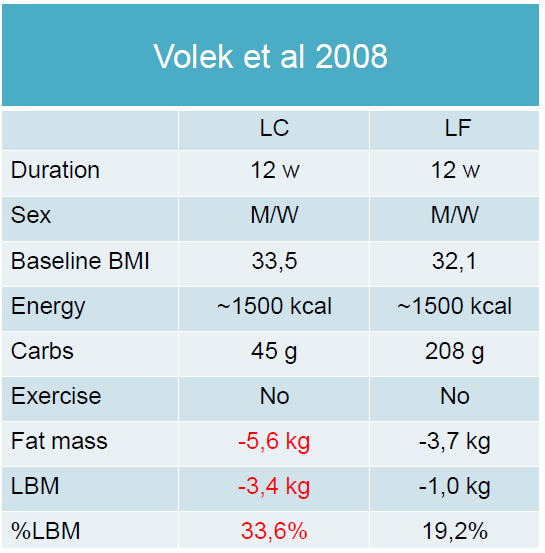 As you can see, weight loss was greater with low carb, but so was loss of lean body mass (LBM) and the percentage loss of LBM was not much different between diets. 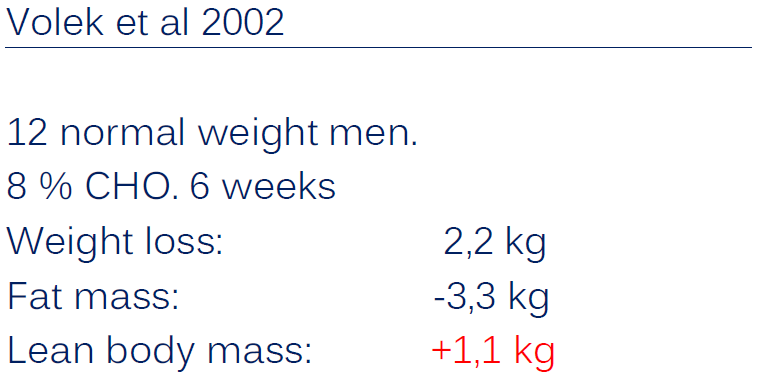 As is usually the case in weight loss trials, the men lost more weight than the women. 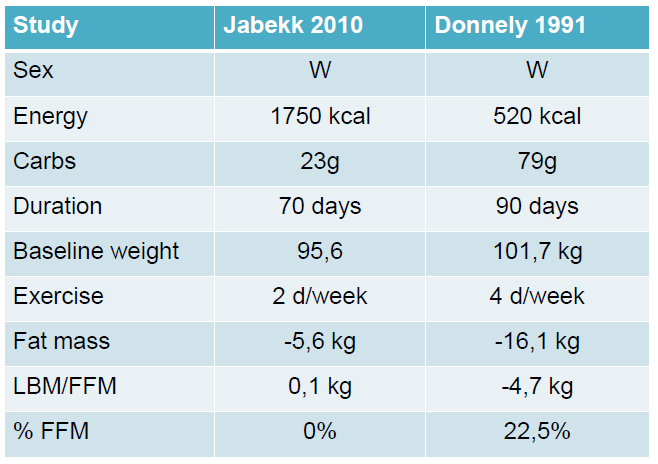 And once again low carb caused a greater weight loss, but also quite the loss of lean body mass. The women eating low fat seemed to lose the greatest percentage LBM, which is also a recurrent theme in weight loss trials. One of the goals in this study was for the low fat group to reduce their calorie intake to the naturally reduced level of the low carbers. 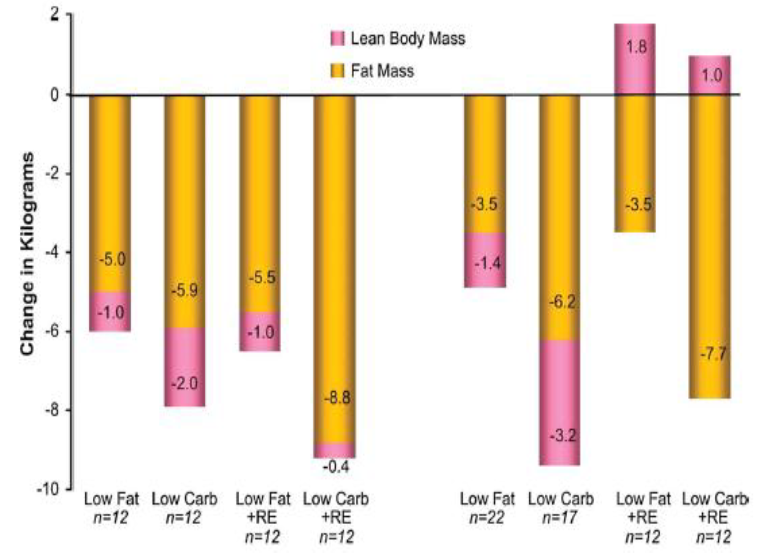 Weight loss did not differ between groups, but loss of LBM was significantly larger in the low carb group and over 25% of the LC weight loss was lean body mass. Body composition was measured using bioelectrical impedance analysis (BIA). 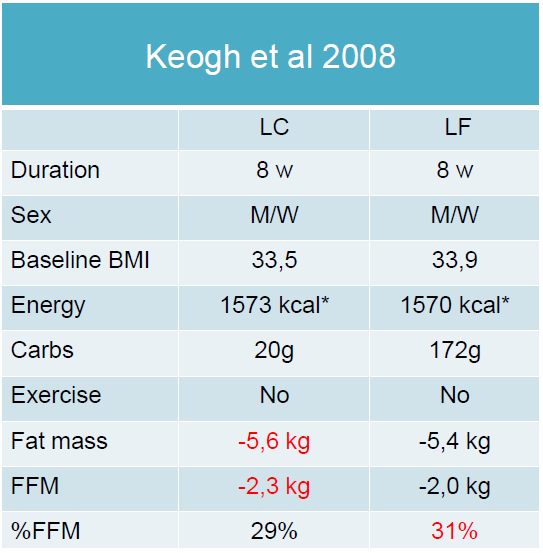 Weight loss with low carb was double that of low fat and this time loss of fat free mass (FFM) was actually quite larger in the low fat group. LBM is what is left if we remove fat mass and skeletal mass. Fat free mass is, not surprisingly, total mass minus fat mass. LBM and FFM are used interchangeably. It seems that loss of non-fat mass is common, regardless of diet, but we need to look at some more studies to get a clearer picture. This is a short study, but with 83 participants. The results are pretty similar, both when it comes to weight and LBM loss, but in both diets around 30% of the lost weight was LBM and that is rather much. Both diets were 30% energy restricted and designed to be isocaloric. 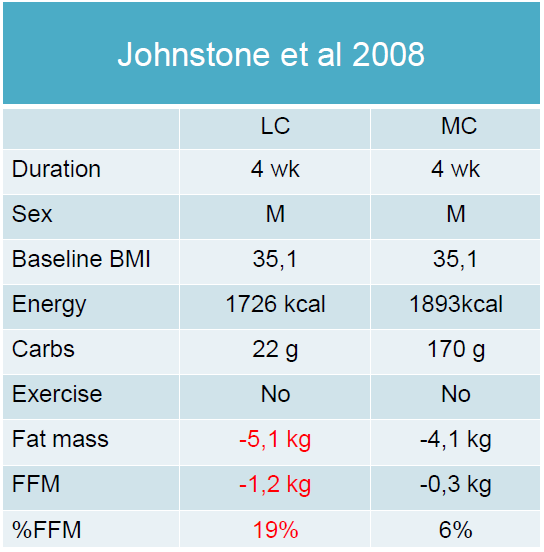 Once again there was a significant loss of fat free mass with both diet strategies. An Atkins type diet was compared to a regular calorie restricted low fat diet in 40 men and women. 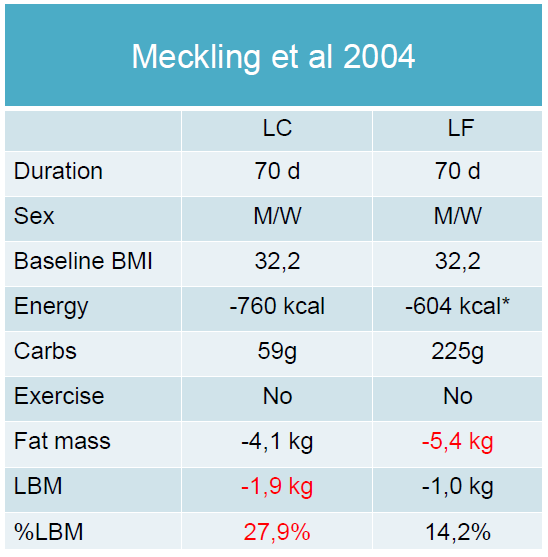 Weight loss was greater with low carb, but so was loss of LBM. So far, there seems to be little truth to any claim that low carb preserves LBM. Alexandra Johnstone and coworkers showed us yet again that weight loss is greater with low carb, but that so is loss of FFM. Notice that this is a study of men only and so the percentage loss of FFM is much smaller than in studies of women. 118 people participated in this eight week study and were scanned with DEXA. 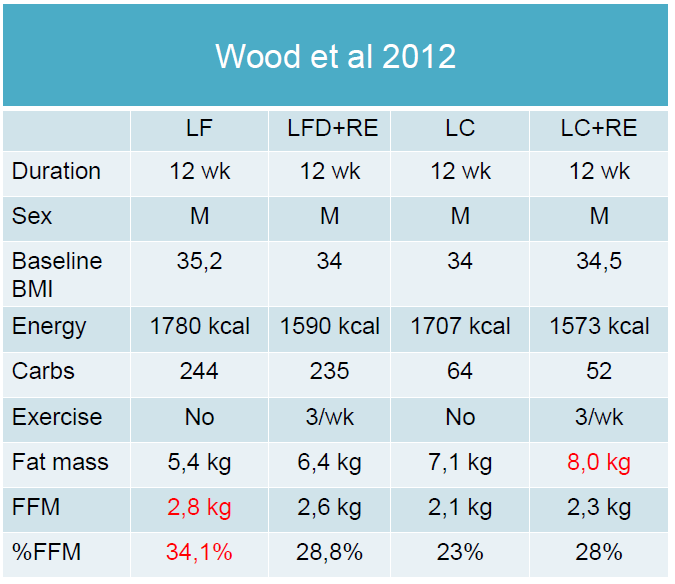 Weight loss was greater with low carb and both groups lost about 20% FFM. 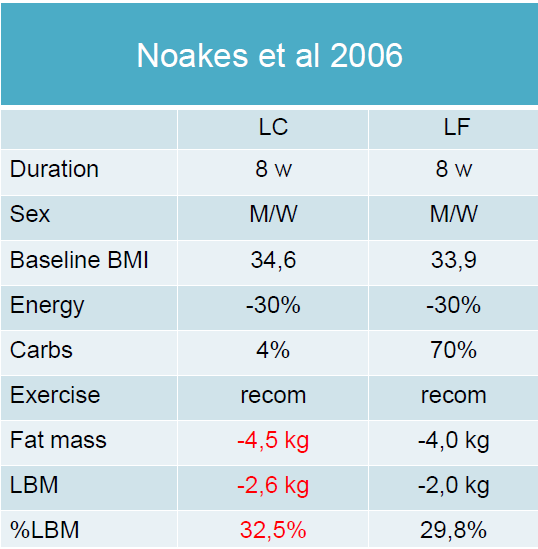 To summarize, loss of fat mass is greater with LC than LF diets. 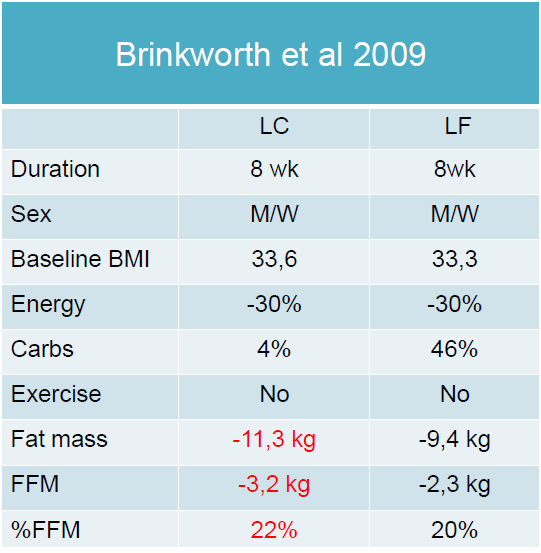 Loss of LBM is common on both LF and LC diets, but as we will see, not obligate. But there are some considerations to make first. First of all, any loss of water will usually be considered LBM and so if there is a difference in water loss between diets, this will affect loss of LBM/FFM. Carbohydrate restriction usually does cause a greater loss of body water, at least in the initial phase of the diet. 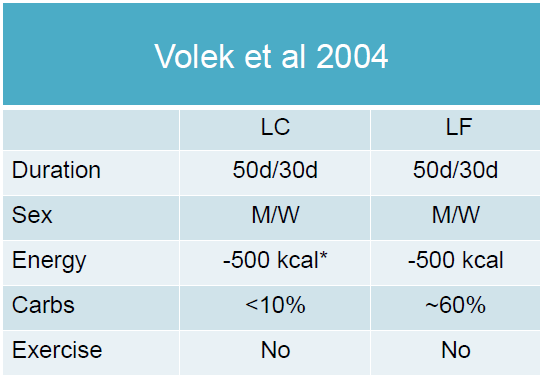 Loss of glycogen with low carb will cause a parallel loss of water and so there is reason to expect a larger loss of LBM with low carb, and we need to remember that LBM is not a measure of muscle proteins. Although loss of LBM is clearly common on low carb diets, there are studies suggesting that such a loss can be avoided. Notice the difference in LBM loss. One likely advantage of carbohydrate restriction is that the combination of adequate protein intake and high ketone body production spares muscle proteins from being used to produce glucose. The Benoit study is small, but it suggests that loss of LBM is not a necessary consequence of low carb dieting. After eight weeks of a very low calorie ketogenic diet, lean body mass increased by almost 1,5kg while 15kg of fat was lost. So I think it’s time to ask what the difference between these few studies where LBM increases (in spite of water loss) and the RCT’s where a low carbohydrate diet always leads to some LBM loss. But remember also that not all LBM is functional LBM. That is, we expect some loss of LBM and some LBM can be lost without negative consequences. We must remember to keep our feet on the ground, there is no problem with some loss of LBM with large losses of fat mass. To make a long story short, there are some important factors we can manipulate in order to reduce loss of LBM. Being a man is perhaps the most effective. 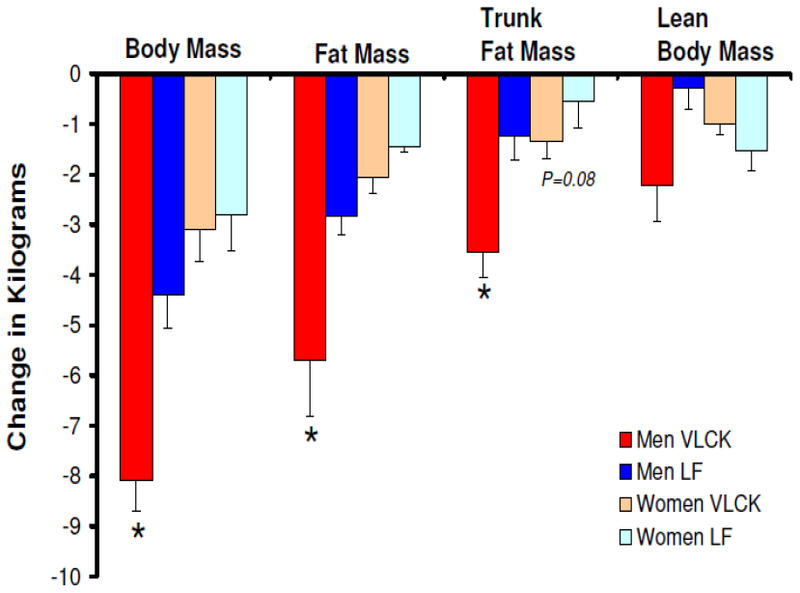 Men lose more fat and less LBM when they lose weight. It’s just the way it is. But both men and women can increase their protein intake. In many of the RCT’s in this post, average protein intake was low, often around 1g/kg body weight/day. The optimal intake is probably closer to 1.8g/kg/day (severely overweight people should use ideal body weight instead of actual body weight). There is also the matter of sodium and potassium that might play a part in the results. Potassium is an important intracellular ion in our muscles and adequate potassium is important for creating an anabolic environment. The trouble with ketosis or severe carbohydrate restriction is that it causes our kidneys to excrete sodium and unless that sodium is properly replaced the kidneys compensate by excreting potassium. In short, when optimal body composition changes is the goal, or optimal performance, salt intake is important and should be a good deal higher than the daily recommended intake. In addition to minding our protein and salt intake, we can of course also do resistance exercise in order to increase lean mass retention or even increase lean mass while reducing fat mass. It is, not surprisingly, well documented that resistance exercise, as a part of weight loss, is very effective at reducing lean mass loss, regardless of diet. But in order for resistance exercise to yield optimal results, protein and salt intake must be optimized. 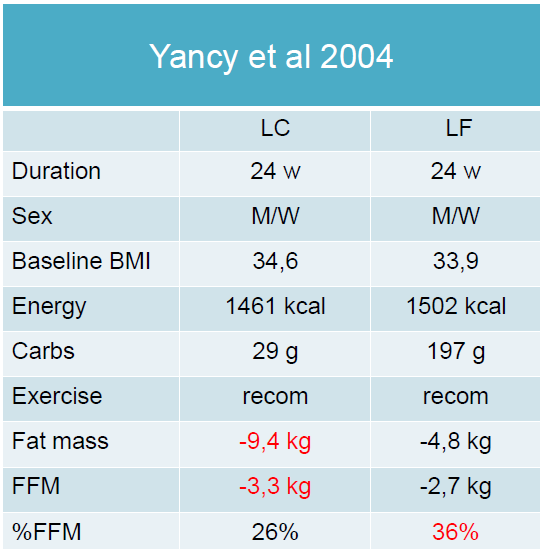 Even though the results favor both low carbohydrate dieting and resistance exercise, I must say that I was surprised at the amount of FFM loss in the low carbohydrate and resistance exercise group, even when considering that some is water loss. After 12 weeks I would have suspected FFM to have increased. But there are once again some factors to consider. First of all, the mean age of the participants were 60 years. This may have caused the results to be smaller than if younger men participated. Also the resistance exercise was not very heavy, it could have been a good deal heavier and it is likely that muscle hypertrophy would then have been greater. Clearly, both increasing protein/decreasing carbohydrate and resistance exercise improve body composition changes. The low carbohydrate diet in this study was not very low. Average carb intake during the intervention was 141g in LC and 126g in LC+RE. Protein intake was 110g and 102g respectively. These are two very different strategies. In our study the participant were told to be in dietary ketosis, but could eat as much as they liked. In Donnely’s study calories was severely restricted. Also in our study the participants exercised twice a week, whereas in Donnely’s they exercised four times per week (resistance exercise). They are both effective strategies both for losing weight and changing body composition, so it is up to us what we prefer. I for one would like to eat as much as I please and not have to exercise that much to get the results I want. 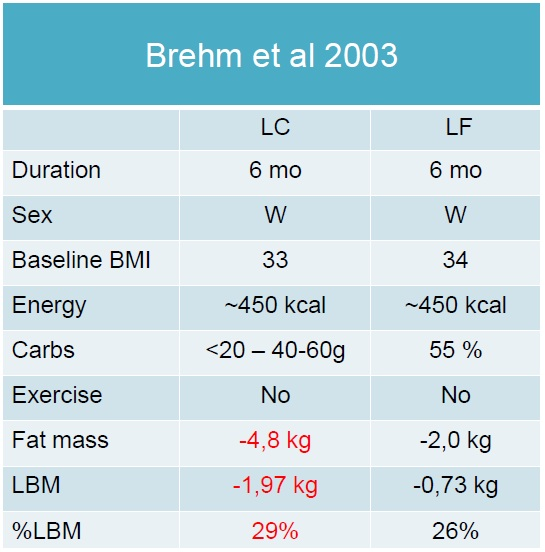 Loss of LBM with weight loss is common but not obligate. A low carbohydrate diet is no grantee for all weigh loss being fat. In order to achieve optimal body re-composition one should reduce carbohydrates, make sure to eat enough protein and salt, and do regular heavy resistance exercise. The results one can achieve are quite astonishing. I can't help but feel that most of these study results mean little for people who are already lean and experienced lifters, sprinters, etc. For example, I wonder what would be the optimal strategy for someone looking to go from ~8% bf to ~5% and whether that would decrease performance. I like to eat low carb and have never noticed symptoms of hypothyroidism or low glycogen, despite a high activity level from powerlifting and ballet. I always think to try lower fat, but I don't like the foods as much and have a bit of trouble sleeping–I haven't stayed high carb long enough to comment properly though. Have you seen the somewhat recent study with gymnasts and ketogenic diets? Their performance was unchanged, but they lost body fat. Their protein intake was quite high while calories decreased a bit. These are studies of overweight people and the results do not apply directly to situations where we want to lose only a few percent body fat. But it is the same principles that apply. To lose fat we need to increase the oxidation of body fat and to avoid to much lean mass being used for gluconeogenisis protein intake needs to be high. The thing to remember is that fat loss becomes more difficult the less fat we have on our body. A lean person must often restrict calories so much that he will often go hungry to reduce fat mass, whereas an overweight person will be able get much more of the daily energy requirement from body fat and can thus eat as much as he wants and still lose weight. Bottom line is that the same principles apply, but that it may be much harder and one may have to be much stricter with diet and energy intake. Performance can be unchanged despite dietary ketosis, but it depends on what sport we are looking at. Gymnasts could probably maintain their performance in single events despite ketosis, but they would most likely need to ingest carbohydrates if they are to do more than one exercise. In endurance sports we have seen that although total race time is not necessarily reduced after a high fat diet, sprint performance during the race may be reduced. Though I don't have the answer, I would like to think BBer levels of bf % are achievable without conscious calorie restriction–it's not implausible. I am strict about what I eat but eat >4000 calories; my body fat is very low, but I have a friend who is probably lower than berkhan, and he eats quite a different diet (more balanced, with lots of carbs from rice or potato varieties). As you mention, mineral intake is often overlooked when reducing carbs significantly. I wonder if studying someone like Takeru Kobayashi would provide some insight. Maybe the carb intake is more important for adequate training than the actual event in question. I would guess that 100m sprints and below would be fine with even a ketogenic diet? …while the sprint and weightlifting training/practice *might* suffer. I average almost 100g carb per day, but there is a girl at my studio who does very strict keto (<20g maybe), and she doesn't seem to have any problems handling a high workload; in fact she is one of the best in terms of endurance during intense practices. Especially reviewing Jabekk et al 2010!!! What has worked best for me is what female figure athletes do (Paleo + fat + protein 1g/POUND + RE + HIIT + cardio). Hormones become more and more important as we age. The men seem to have less loss of LBM in some studies and this is simply related to having more T which is insulin sensitizing. What I don't like is the calculation of either LBM or FFM. People who are extremely IR ( insulin resistant) carry significant amounts of fat/TG in the muscles and we are 40-60% muscle, no? 1-2 kg loss of FFM is no big deal particularly if it's fatty-muscle (analogous to fatty livers or fatty hearts in metabolic syndrome). I think your strategy is a good one. Didn't say anything about it here, but inflammation matters a lot when we want to lose fat, and so a paleo LC diet combined with adequate sleep and rest is probably a good strategy. Also true about the intramyocellular triglycerides with METS although an endurance athlete will also be able to store quite a bit of fat in muscles. I think you're right in that conscious calorie restriction is not always necessary, but for those who struggle with lowering fat percentage it may be necessary. There are also large individual differences and factors such as hormonal milieu, inflammation and thus also rest/restitution/periodization will affect fat storage. And of course genetic disposition. It's true that short events like a 100m sprint is most likely not affected by a ketogenic diet. My experience is that during longer lasting events, carbohydrate intake will improve performance, but it is a careful balancing of carb intake versus fat oxidation. If carb intake get so high it significantly reduces fat oxidation, performance is reduced. The goal is usually maximal fat oxidation combined with long lasting glycogen stores. So although we do see those who seem to do fine on longer lasting events on ketogenic diets we need to ask if they could have performed even better with some more carbs? The muscle fiber type question is interesting, but I have never seen data suggesting that nutrients affect muscle fiber type. I'll try to look into it. FWIW, Jimmy Moore's DEXA results on his personal nutritional ketosis experiment. Different diets affect your body in different ways. In general, when you use a diet following conventional wisdom (low-fat, high-carb, low-protein) you'll lose more lean body mass in the process than when you follow a primal diet (high-fat, low-carb, adequate protein). The goal of your diet should be fat loss, not weight loss – so you have to find a way to make your body use its fat supplies for energy while leaving the lean tissue intact. I have been looking for this kind of information on weight loss from few days, so thanks for sharing this valuable information. I am 22 years old, 5.9ft tall and 190 pounds. My weight loss goal is to lose 30 pounds for 2 months in a healthy way. I have been exercising from the past 2 months, but I lost only 4 pounds. Is this low carbohydrate diet helpful for me in losing 26 pounds for 2 months in healthy way? A well formulated low carb diet is perhaps the healthiest way to shed those pounds. I would recommend reading Phinney and Voleks books: «The art and science of low carbohydrate living» and if you like exercising «The art and science of low carbohydrate performance» They are great help and offer lots of practical advice. Hi Parker… I would like to know your calorie intake per a day and the foods which you are eating. In a week how many hours you are spending on exercises? As per our body requirements you have to maintain good calorie levels and have to give sufficient time for exercises. Have you consulted any nutrition to know your daily calorie intake? While dieting these are the key points we need to concentrate. Our weight loss does not depend on how long we are in diet, it depends up on how many calories you are taking and how much time you are doing working outs. Doctor suggested me to take calories in between 1800-2000cal per a day. So I am consuming calories from all the foods for one day is between this range. I will do exercise for 3hours, meditation for 4hours and swimming for 2hours in a week. How many calories I need to consume to reach my weight loss goal? Reduce your calorie intake and see the results, take 1500-1700 calories per a day. 4 pounds of weight loss in months is low, I agree. Now you are trying to lose 26 pounds in 2 months. Nutritionists are recommending 2-3 pounds of weight loss in 7 days, according to this it would be better to lose 16-24 pounds. You can loss 26 pounds in 2 months, but you have to stick diet tips and have to spend more time in working outs. Unrelated to post, but has anyone else noticed MacKeeper or other window pop under when coming to this english version of the site? It only ever happens to me here. Of course I have a Mac…. Pal, it's been about two months, it hasn't gone away. Through Safari and Firefox, not Google Chrome. If it's not just me (it shouldn't be, otherwise at least on other site should do the same and none do) so I thought to bring it up in case your site managers might want to look into. Thanks for the heads up about the popups. Will try to fix it. I sorry there hasn't been much activity here lately. Been focusing much on the Norwegian blog as I just published a book in Norwegian and is trying to follow up on that. If I get the time and have something I consider remotely intelligent, I'll write it down here. Might have something on lactate and low carbohydrate performance coming. We'll see. Hello Parker… Taking proper diet is main important to lose weight. I think, you need to consume negative calorie foods like cauliflower, cabbage, carrot, and radish. These foods help you to burn extra calories in your body. Previously I had weight issues and by consuming low carbs, fruit salads and regular exercises helped me to lose 25 pounds in one month. If you follow this type of natural weight loss supplements you can reach your goal. Thanks Pal, I see today that it's fixed. Many congratulations on the publication of your book! Is this true, had you lost 25lbs in one month by consuming carbs, fruit salds and regular exercise? As per the suggestion given by Samuel, one is able to lose only 16-24lbs for 2 months in a healthy way. Did you get any health problems by losing 25lbs in one month? Hi Parker… Watson tips are pretty nice; according to diet negative calories are very helpful in weight reduction. But nutrition experts are always recommending only 2-3 pounds of weight loss in a week, so Watson weight loss might be in an unhealthy manner. Never ever go for fast weight loss methods, it creeps you. Besides of Watson tips you can take Green Coffee Been Extract two times in a day, one in the morning and the other in the evenings. It might be helpful in your weight loss journey. Hello Parker.. Its happened to me. I have lost 25 pounds in one month. During the month period, I have taken negative calorie foods and these foods burn more calories than what we get. I did regular exercises twice in a day helped me to achieve my goal. Unless and until you work hard physically, you can’t lose weight. First of believe yourself and I always follow the statement “Think big, act big and get results big” and I implemented the statement too. Hello Watson… I had gone through your suggested site, really it’s worthy. Thanks for sharing your weight loss experiences with all of us and agree with your words regarding role of negative calorie foods. It would be healthy to cut your pounds 25 to 10 pounds in a month and it would be healthy . Absolutely nice! It was a long article but definitely worth my time because I learn a lot especially when it comes to diet and weight loss and many more.. Really really nice! Thanks for sharing what you know.